My son and I were working on a fix-it project the other day. The interest and capability to fix things around the house, in the car, all things mechanical or things that require assembly – well, that I inherited from my father and have passed on to both of my sons. So, there we were fixing something, alternating between holding the flashlight on the problem while the other worked the wrench, then screwdriver. We are patient with each other, as my father was with me – we know how to work together. I cherish these moments with him. They are sacred. In the background his ipod was blasting. I liked the music – didn’t know the artist, hadn’t heard the tune – but it was pleasing. I tuned in immediately to the lyrics when I heard the word, “grace.” It didn’t sound like praise music – more electronic, rock-like. It wasn’t Mumford & Sons, but as I listened on I was sure that a gospel message was being proclaimed. But for the fact that it was my son’s playlist, I would have guessed it was a Christian band. My son does not listen to Christian music. His playlist is determined by the music first – he has a particular yen for the electronic genre. But the lyrics are important to him, too. He selects music with poetic lyrics – lyrics that mean something, say something, ask something. I was thinking about this as I was zoned in on the song which was nearly done – what was it saying about grace? There was an anxious, hyped up, loud sort of sound to the tune – sort of an edge – something uncomfortably comforting. Whatever they were singing about grace was more like the harsh reality of grace – the implications of knowing grace’s function in one’s life. I smiled. Indeed. God’s love. That’s what I think of. Relentless. Forever. And that took me to a memory of another sacred moment I had had with my son. To our bedtime routine when he was a young boy. 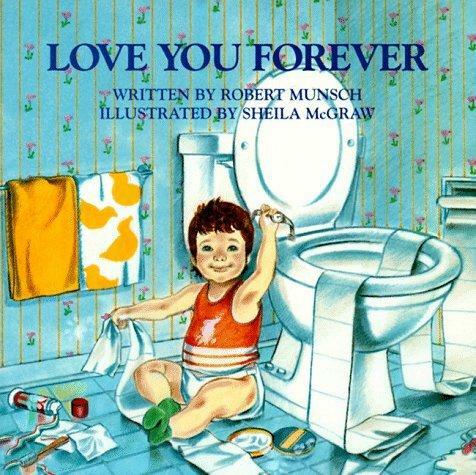 One of my son’s favorite books was a template for our own Love you Forever bedtime exchange. After story time and saying prayers I would tuck him in, he’d close his eyes and I began the final litany of the night, to send him to sleep with the thought of who loved him – relentlessly and forever – loved him. “Who loves, Tom?” I would ask. And a mother’s love, too. Relentless. Forever. Through thick and thin. Never giving up, or walking away. A forgiving love. A tough love sometimes. A belief in my son so deep of who God created in him and called him to be that no matter how many times he has gone astray, gotten off track, seemed lost, I am here for him. I believe in him. I know he will find his way. Know he has found his way. Relentless love. Biblically what comes to mind as the word that describes this ongoing never giving up, forgiving love is the word, steadfast. There’s not as much of an edge to it as relentless, but it conveys the same essence – or attribute – of God’s love for us. We finished the project and as I moved through the rest of the day I wondered how it would read to subsitute relentless for steadfast any time I came across it in scripture. Would it sink in deeper? Would I experience the truth of God’s Word more deeply with the sharper, edgier sounding relentless than the more comforting ‘steadfast?’? And that’s just what happened this morning at the first psalm, Psalm 5. With the switch, the Holy Spirit whispered something deeper. I heard in God’s Word – ‘another chance’ – God has not given up on me yet. The lines of the path I was set upon have been blurry lately – I haven’t been able to see the light through the trees clearly enough to know where I’m headed. But by thinking of God’s steadfast love as infused with the type of love I’ve known as a mother, – that relentless love – I felt God’s hand at my back. God’s got my back. And He leads me and makes His way straight before me. Turns out it was a Christian band. The band is Citizens. The song, Made Alive: https://trinityseasons.files.wordpress.com/2014/08/04-made-alive.m4a. This entry was posted in Whispers and tagged abba father, forgiveness, hear, Holy Spirit, lectionary readings, Psalm, scripture, WORD. Bookmark the permalink.